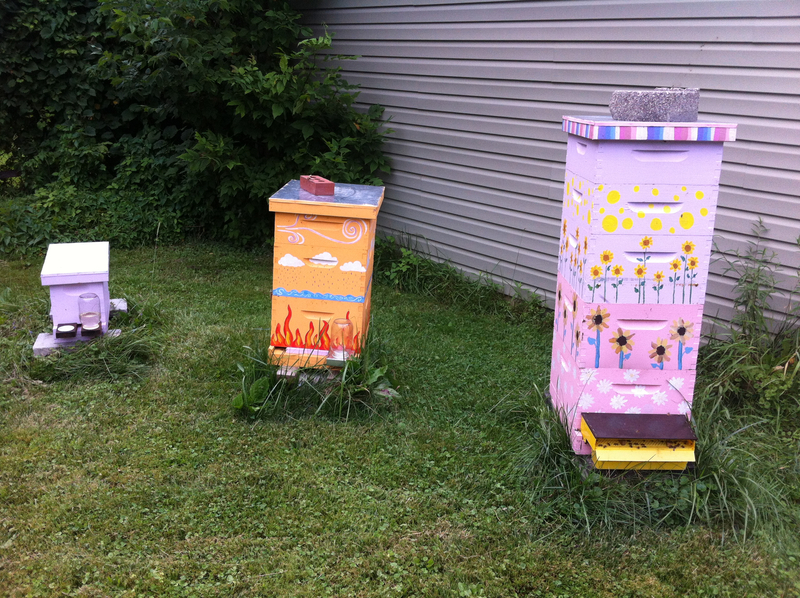 Hives of all sizes, I feel a little like Goldie Locks – A Daddy Hive, a Momma Hive, and a Little Baby Hive. 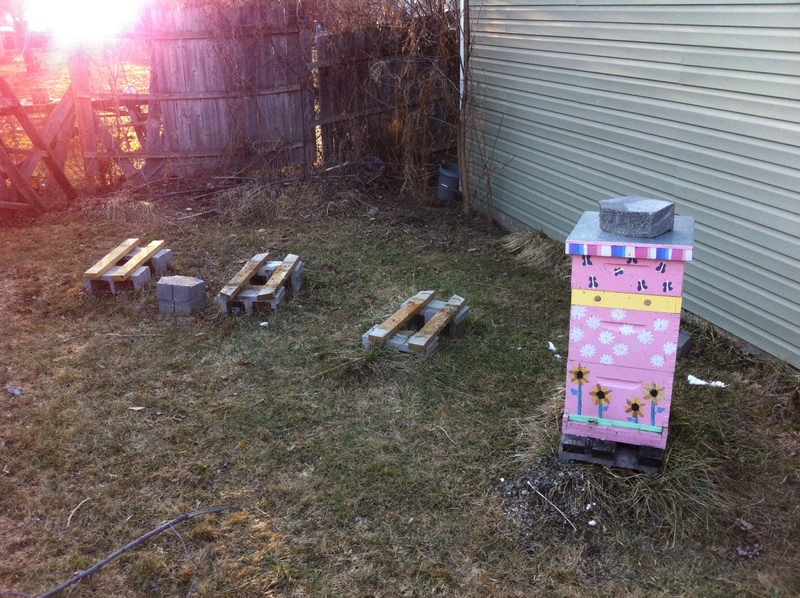 My pink hive, the 5-story monster, is the strongest (2-time survivor of winter) – I’m really nursing this one and hoping to gain a couple additional colonies from it next spring to keep these genetics going. The orange hive, the 3-story momma that grew from my southern spring package, the one that I thought went queenless a few weeks ago that I found to be queen-right – which I direct-released my new ankle-biter queen. 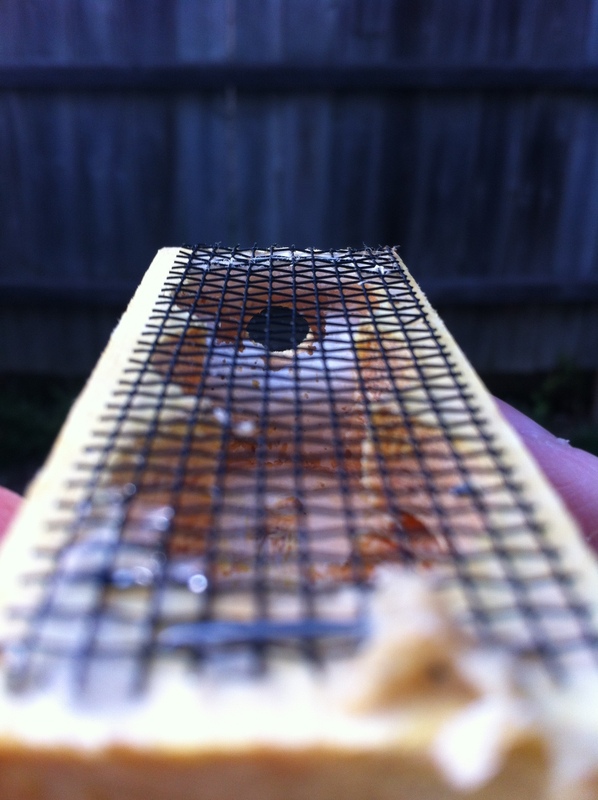 And the itty-bitty baby hive, the nuc on the left, I made with the southern queen from the orange hive – yesterday I checked to see if the bees had released the queen from her cage, and she had not been (they didn’t seem to go for the marshmallow blocking the hole), so I released her myself. Today, I found the baby hive getting robbed by my other hives. It was very interesting behavior indeed! The guard bees wrestled with every unwanted visitor, but there were two many intruders and so nearly all who tried to enter made it inside. Since it is a nuc, and I am currently feeding them with a boardman feeder, I don’t have a proper entrance reducer, so I’m using another boardman feeder base with a jarless lid to block the way. That reduced the area needing to be guarded, but it still seemed that the guards were struggling to protect their territory, so I went to google for what to do next. One place suggested rubbing Vick’s vapor rub around the entrance to confuse the smell for the robbers – I don’t have that handy. Another site mentioned blocking off the entrance with wire, I don’t have that handy either. 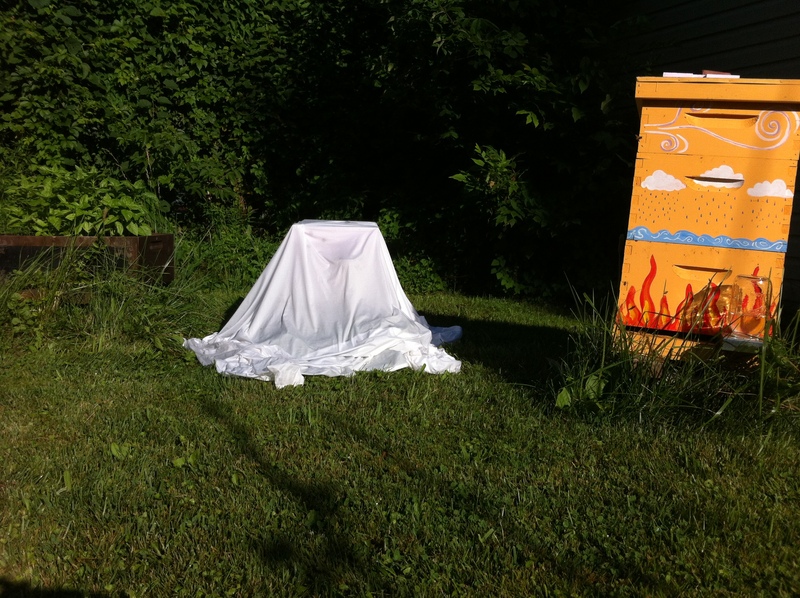 Another site recommended draping a wet bed sheet over the hive, which would apparently allow foragers from the hive to still come and go since they will re-orient themselves accordingly, but would completely deter the robbers from entering the hive because they no longer know where the entrance is based on smell. I had a spare bed sheet. I chose to try the latter recommendation. The bed sheet worked immediately. All new robbers trying to get into the hive seemed to lose all interest in finding the entrance, while all robbers trying to leave remained trapped under the wet bed sheet. I can’t know for sure, but the few I saw leave the hive by crawling out from under the bed sheet I believe to be the rightful owners of the hive, while the ones that appeared to have crawled up the bed sheet to as far to the top as they could get I believe to be the confused robbers – and I gave them mercy and allowed them to escape by lifting the sheet briefly. I’m going to leave the sheet on one more day and see if the robbing has been forgotten. Right before I had noticed the robbing going on I had set up this actual robbing station on the other side of my yard in hopes of cleaning up some frames that I plan to use this year. The true robbing station seems to be a hit, and has been very busy on this 90-degree day, and maybe especially because I think we are in a dearth right now. I wonder if setting up this robbing station ultimately led to my nuc getting robbed, or if in fact I didn’t add enough bees to the nuc making it a weak hive. Things to ponder and learn from, as always. Learning something new is always fun to do. Especially when it comes to helping bees! For the last four weeks or so my honeybees have quit visiting the bird bath water source I’ve provided them. A green icky algae had slimed the entire birdbath, and even having since cleaned it and filled it with fresh water, my bees had still not returned to it. Usually I fill the birdbath with dried leaves, sticks, and stems from plants to give them a landing pad or something to grab onto if they accidentally fall in, but still no bees were interested…and that darn green algae came back. So I cleaned out the birdbath again, and remembering back from my beekeeping class that they tend to prefer more “odorific” water, I decided to try just adding a little bit of dirt to the water. Not even an hour later, I kid you not, bees are coming and going once again! 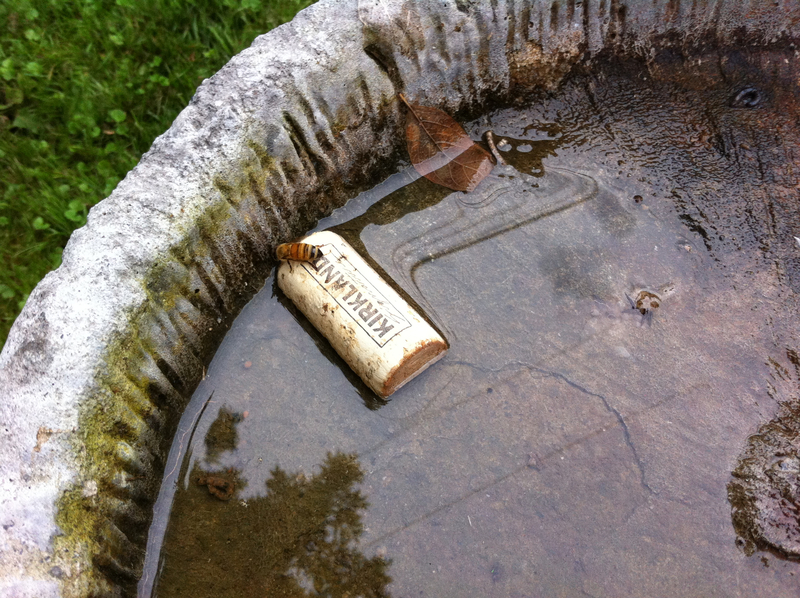 I’ve set a couple wine corks, cut in half, as a floatation device instead of twigs and such, and am having a blast watching the bees use them. I’m not sure where they were getting their water for the last month, but undoubtedly this is much closer for them. And maybe that gross green algae won’t creep back since I’m keeping this recipe simple – start with water, then just add a little dirt. My two colonies had been doing very well until one (the package I purchased this spring) began declining in population. I noticed it happening but was too busy to inspect for a problem at the time, and before I knew it 4 weeks had gone by without opening up the hive to see. Sure enough, no eggs, no larva, very little capped brood, and no queen in sight and too late in the evening to do anything about it. The very next day, I took a frame of eggs, larva, and capped brood from my strong over-wintered hive and gave it to the weaker one, hoping this would tide me over before the workers decided to start trying to lay themselves. Searching ever harder for the queen I came across frame after frame of supercedure (emergency queen) cells, all of which appeared hatched out of or in waiting of an egg, but one very tiny one was sealed closed. And then I found her, the queen! She was in there afterall. And she even appeared to be dipping her bottom into a cell or two, but when I looked I saw no egg. Maybe she is a brand new queen just starting to get the hang of laying, she seemed large and slow like she had been mated. 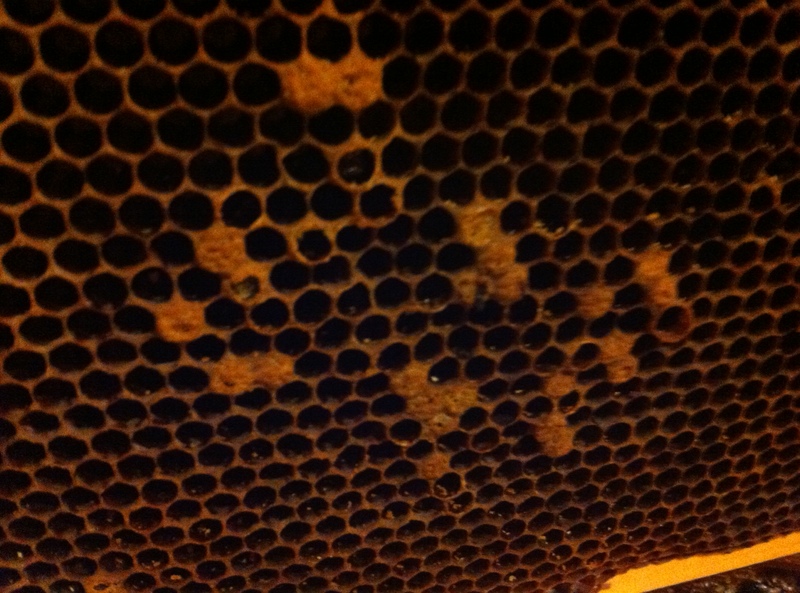 I decided, satisfied for the moment, to close up the hive and wait a couple weeks to check back in on her. I’d been planning on replacing this queen from the beginning with this hive, since they were from Georgia and my goal is to keep local honey bees, and had been on a waiting list for a special “ankle-biter” queen from Meghan Milbrath. This ankle-biter queen has special genetics to help protect against the mite known as varroa destructor, the very mite that took down three of my colonies over the winter. The funny thing about the timing of all of this is my ankle-biter is ready to be picked up! So today, nearly two weeks after I found the queen in my weak hive, I tasked myself with searching for her again to capture her and allow the hive to be queen-pheromone-free for at least 24 hours. This will allow the bees to recognize that they are queenless and hopefully cause them to accept more willingly this new special queen that I am bringing them home tomorrow night. The weather was lousy today, raining off and on, and super windy, not the kind of day you would plan on opening up your hive to the elements, but I was determined to do my best for these bees in preparation. Frame after frame, I did not see the queen. I began having to double-back over frames and brood boxes I already searched, excitedly finding some 3-day old larva, still not seeing any eggs but it was very overcast and dark that they had to be there if I was seeing 3-day-old larva, and I finally found her in the second story hive body closer to the last honey frame on the end. What in the world was she doing there? Finally locking in on her, I now came to the part that I was anxious for – capturing her, marking her, and caging her. Many beekeepers kill off the queen when they go to replace her, but I figured I might as well practice capturing her and marking her, and somehow getting her to go into that tiny hole in the queen cage so she doesn’t go to waste. The whole process went very smoothly I could hardly believe it! First, I trapped her against the honey comb frame that I had found her on, with the plastic queen marking cylinder cupped over her. Then, I proceeded to slide very carefully the cylinder with her in it against the honeycomb surface, pressing too hard that I was accidentally uncapping some honey at the same time. I think the hard part for me was trying to get her to travel higher into the cylinder away from the opening and also trying not to injure her, all while holding the frame in my other hand – it was more of a patience and juggling game, and she eventually explored the top. Then, I quickly and clumsily took the plunger and pressed it into the cylinder halfway so I could leave her for a bit and start closing up the hive, it had begun to sprinkle very lightly. Once was all closed up, I found my never-before-used blue queen-marking marker and carefully plunged her closer to the grate at the top of the cylinder and dotted her back through the holes. Lightly blowing on her blue dot to help it dry, I began thinking about how I should have a few attendants with her, surprisingly none made it into the marker trap with her. For why, since I have no plans of selling her? Well, I suppose it’s for a bit of practice as well. And I don’t know, maybe I’ll take her with me to Meghan’s in case she has a use for her or knows someone who could use her. Checking in today on my new queen from this weekend’s package of bees installation, I found that she and her attendants had been released from the cage into the hive with a little help from her new workers. 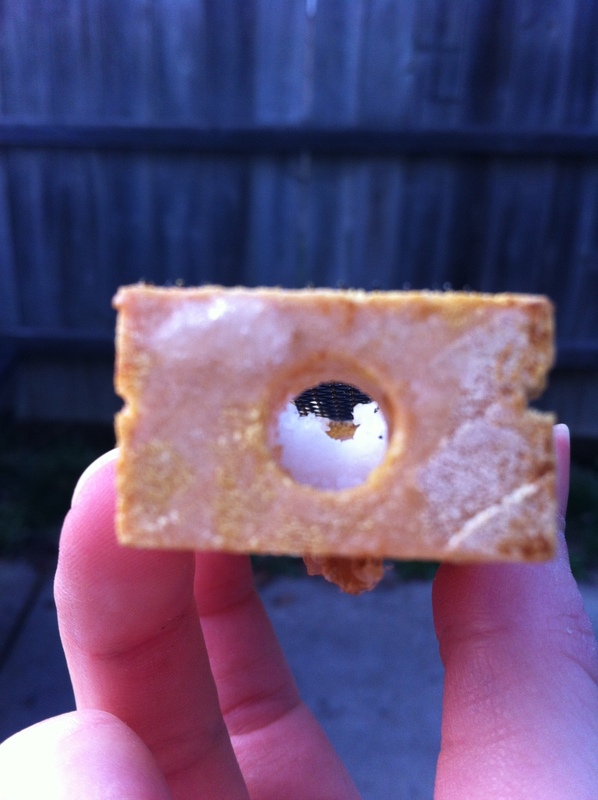 The candy that had been blocking the hole in the end had been perfectly chewed through. Success in just a matter of a few days! And since I had the bee suit on, I figured I might as well get it over with and treat my winter survivor hive for their varroa mite problem. 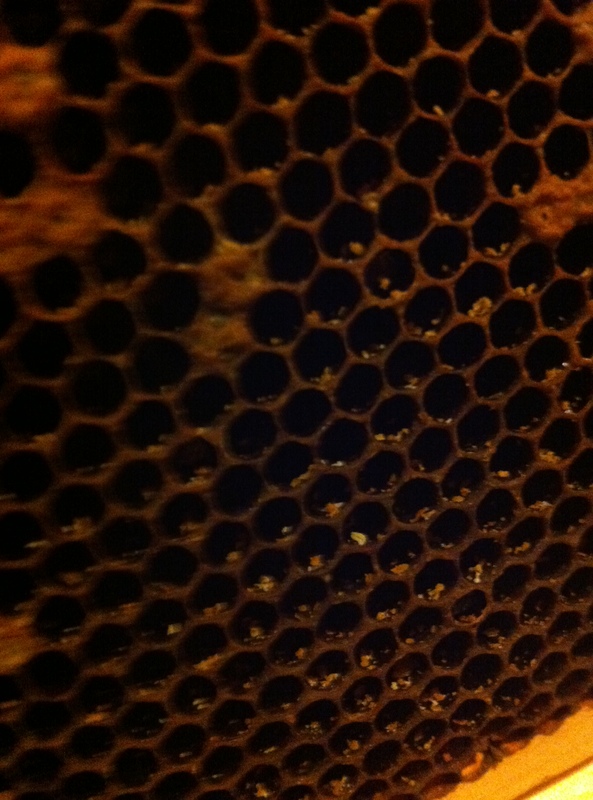 When I opened up the hive, they greeted me with an annoyed buzz and immediately began flying in circles around me. Luckily, despite the mites, their population seems to have boomed. They’re going to be ok, but just as well I treat them now to start getting a handle on it. I had not been looking forward to this treatment, mainly because I didn’t know what to expect. To my pleasant surprise, the Apiguard foil was so simple to use. It comes in a little tin that you just peel of the top, place it on top of the bars in the middle of the brood box, put a small spacer over it, close up the screened bottom board, set your clock for two weeks, and voila! Repeat the the treatment one more time for two more weeks. Apiguard is recommended to be used in temperatures above 59 degrees so that the gel does not crystalize. We’re nearly above that for the next two weeks with highs in the 80’s and lows dipping down into the mid-40’s, but only occasionally, per the weatherman. The bees will walk through the gel and attempt to remove the foreign object from the hive, at the same time getting the gel on them and transporting it throughout the brood and comb within the hive. This first treatment will likely be completely eliminated from the tin within a few days; however, I will leave the tin in place until exactly two weeks and then put a new one in its place for another round. I’m excited to see how this affects the hive. I haven’t seen drones from this colony in a long time. We’ll see if this helps. With the dandelions taking over yards, and all the trees in bloom with little white and pink blossoms, spring is finally here in Michigan and the bees know it. Just last weekend walking by a Cherry Snow Fountain tree, I’m pretty sure every beehive within the radius was visiting this tree. Something delicious must be in those flowers! 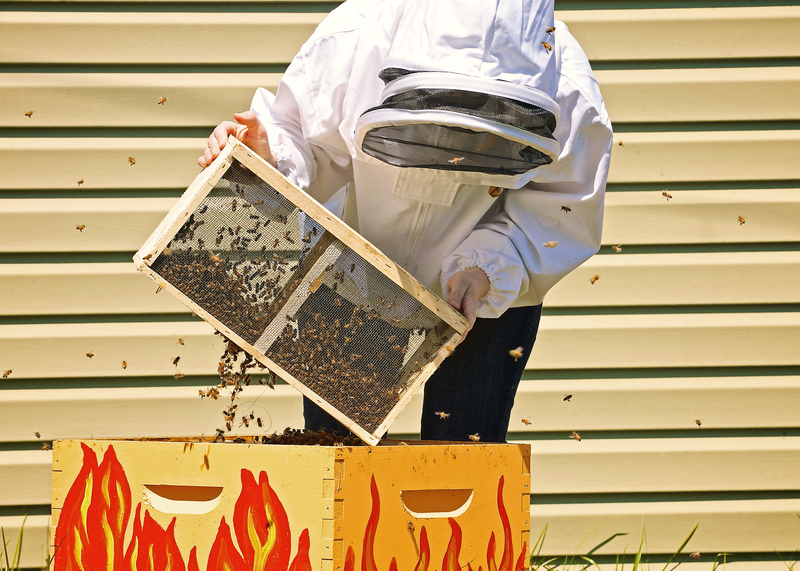 Along with Michigan’s springtime comes new deliveries of packaged bees. I got my new bees from Keith Lazar yesterday. These bees are Italians from the Gardner’s Apiary in Georgia. Andrew took some photos of the installation process. This was the second time I have installed bees from a package. Luckily, I remembered this time to remove the cork on the queen cage from the “candy end” rather than inadvertently releasing the queen via the other cork end! The queen was a beautiful golden color, and she was caged with three attendants. Her pheromones continued to draw a cluster of bees as I worked on her cork and pinned her cage to one of the middle frames of the hive. I’ll check on her mid-next week to ensure she has been released into the hive successfully. Everything went smoothly with the installation process, the new bees in their new home – I might add that they should be quite happy since I gave them full frames of capped honey and already-built comb from my deadouts (less work for them to do)! However, it wasn’t until much later in the day, just out in my backyard putting the chickens away, that I got stung in the face by a rogue bee. No warning at all! Now my cheek is swollen up to the size of a tennis ball. 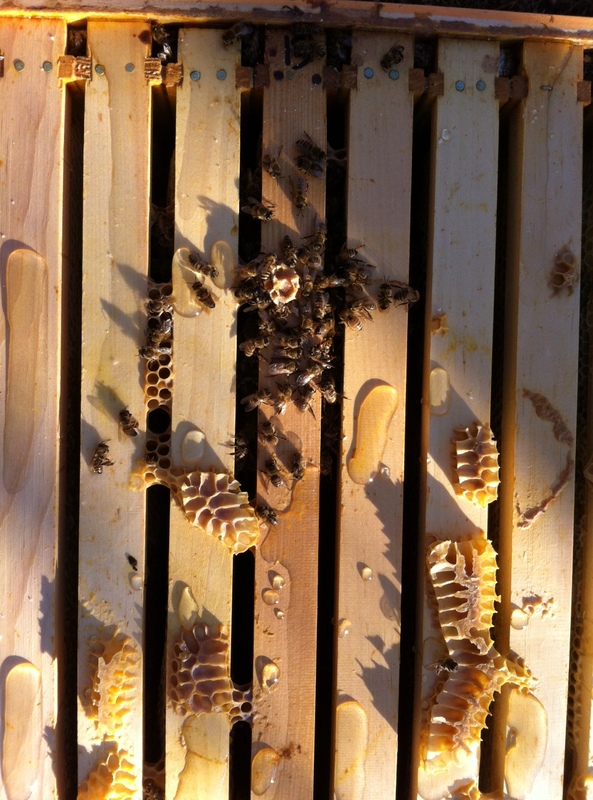 I wonder which hive that bee was from – the friendly Italians who were probably a bit testy from their long and stressful journey, or my over-wintered colony that seems to be getting more and more aggressive (another sign of the varroa mites problem). Today I will treat my overwintered colony with Apiguard to start getting these mites under control! Despite the facial sting, it truly is a beautiful weekend to be spending time outside with bees and BBQing with friends. I hope everyone has a chance to enjoy this weather! 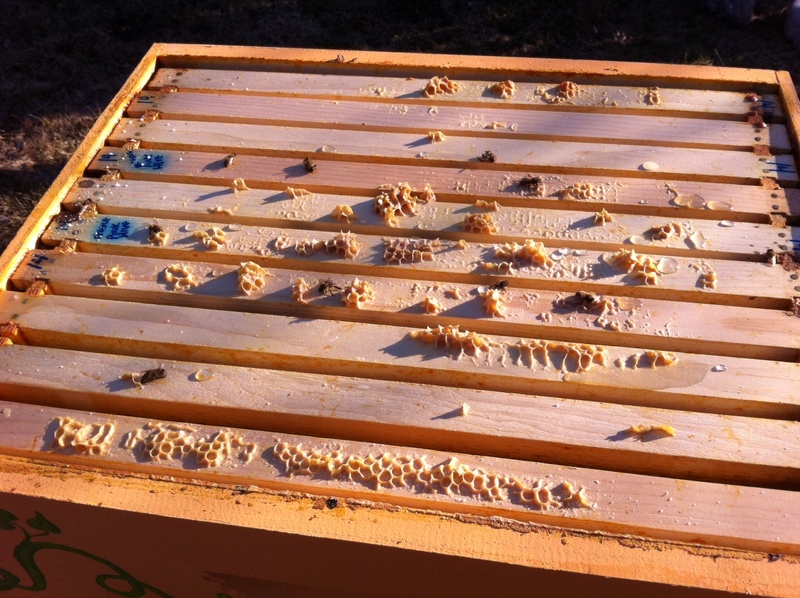 Last month, mid-March, on a warm and sunny day, only one of my hives showed any activity at all. Sadly accepting the fact that I had lost 3/4 of my hives over the winter, I began to breakdown the dead-outs. You can see the bottom board is completely full of dead bees aside from the small area where I had been attempting to clean them out all winter long. Two of my hives looked exactly like this with a medium-sized (a bit smaller than a volleyball) cluster in the top box as well. No signs of starvation (no bees head-first in cells, no tongues sticking out). They had been alive in February, or was the activity I saw that one nice day maybe robbing from my survivor hive? 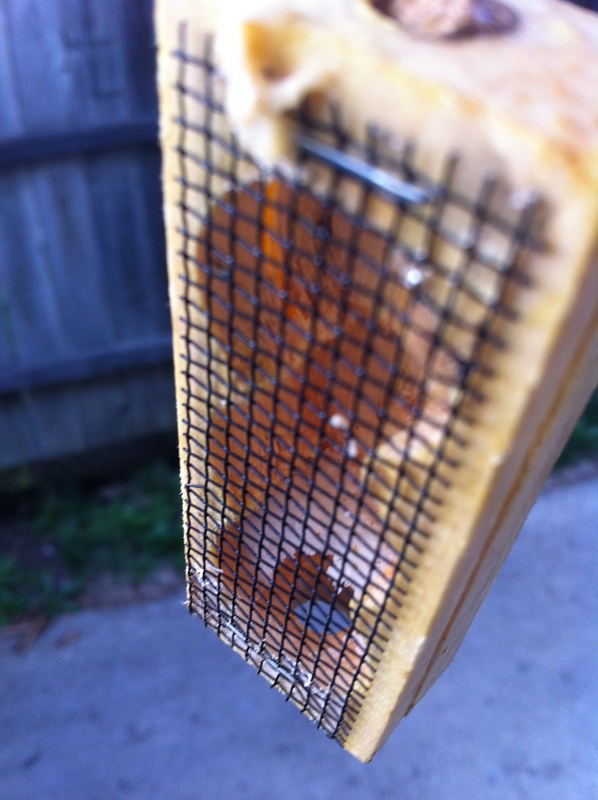 I suspected a possible ventilation issue since so many dead bees were blocking air flow from the bottom board, but was unsure of whether that could cause a hive to die like this. 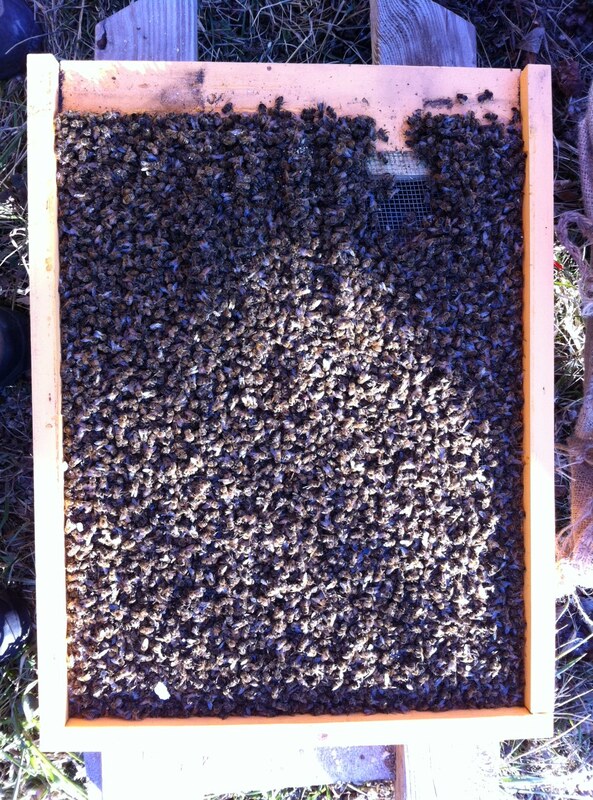 The MSU Study hive (purple hive) had the smallest cluster of all (the size of a baseball) and hardly any bees on the bottom board. I believe this hive died back in November just as winter was beginning here in Michigan. At one point it had been my strongest colony, and one guess I had was that it swarmed late in the season causing the hive to split into two smaller colonies where the one left behind was too weak to make it through, or another guess I had was maybe this one died due to collecting too much pollen at a critical point at the end of the year for the over-wintering brood. Luckily, I have a great bee mentor to help me determine the cause of deaths. Yesterday she came over, and while I always learn so much from her, this little tidbit blew my mind. There was a considerable amount of crystallized Varroa Mite pee in the brood cells of each of the dead-outs. Go ahead, click on the photos to expand them – check it out! It can look a little like crystallized honey or even little granules of the sugar that I used to overwinter each of my hives. I had seen this before, but never knew what it was. Amazing that this is the evidence of just how bad of a Varroa Mite infestation I had in my hives last year. Speaking with Meghan Milbrath, she said last year was one of the worst she had seen for Varroa Mites. As she’s pointing out the little specs in my brood cells to me, I’m recalling all the deformed-wings on my bees last year that were getting kicked out of the colonies, as well as lots of the poor girls foraging with mites riding on their backs. Although I had treated all of the hives (except for the MSU hive, of course) with Mite-Away strips, the strips had been expired since I had purchased them back in the spring time. I wasn’t sure at the time if they would do much good, but I must admit that I thought they would help more than they evidently did. So we’re back to one hive for the time-being. But not for long! While I’m extremely pleased to have a survivor this year, it’s a good idea to think ahead and have at least one more hive on hand to be able to help supplement each other as needed throughout bee season. And so I have purchased a package at the last minute from Keith Lazar. Bees are to arrive on May 2nd! I’ll tell you all about these girls once I get them. In addition, I’m on a waiting list for a special hybrid, mite-biting queen – she’ll bite the legs off of these darn Varroa Mites and raise daughters to do the same. I’m really excited for this little lady, she’ll be a great addition to our neighborhood and I’m interested in seeing how her genes affect mite population over time in our area (with any luck!). 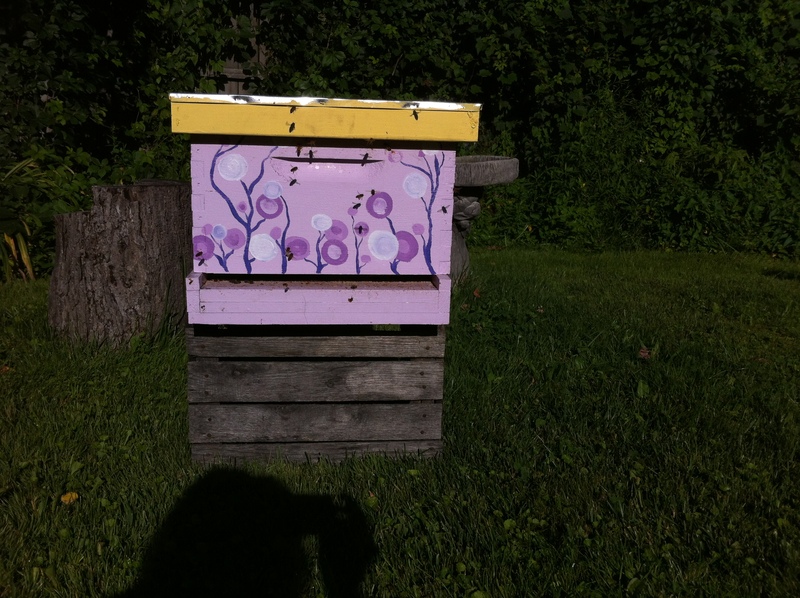 It’s the first day they’ve shown their faces this year, pink hive likes the 45F weather. I’m surprised that yellow hive isn’t out as well unless they died between last week and now, but maybe they are just more picky and want a warmer day.